The first meeting convened with 36 delegates and eight alternates. There were 12 original clubs from Texas that joined Lionism when it was officially formed. These were Abilene, Austin, Beaumont, Dallas, Fort Worth, Houston, Paris, Port Arthur, San Antonio, Temple, Waco and Wichita Falls. These clubs are known as the Founder Clubs. October 8, 1917, Texas became District 4. In 1921 District 4 became District 2 as a result of the International Convention in Oakland, California. 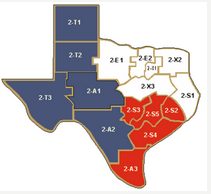 At the 1930 Convention held in Austin, Texas, District 2 was divided into five sub-Districts: 2T, 2E, 2X, 2A and 2S. These sub-Districts spell T – E – X – A – S.
After the 1942 Convention, District 2S was divided into three Districts: 2-S1, 2-S2 and 2-S3. This increased the number of districts to seven. At the Convention held in 1947, District 2T was divided into two Districts: 2-T1 and 2-T2, bringing the number of districts to eight. At the convention in 1958, District 2T was divided into three Districts: 2-T1, 2-T2 and 2-T3. This increased the number of districts to nine. At the Convention in 1959, Texas divided into fifteen Districts: 2-T1, 2-T2, 2-T3, 2-E1, 2-E2, 2-X1, 2-X2, 2-X3, 2-A1, 2-A2, 2-A3, 2-S1, 2-S2, 2-S3 and 2-S4. At the convention in 1988, Texas was divided into sixteen districts adding 2-S5. There are still sixteen districts as of 2010. As of May 1, 2014, the MD2 Texas has 26,070 members in 899 Lions Clubs. This is the most in any State in the USA on both counts.